Autumn is here and what a perfect evening for a steamy bowl of butternut squash risotto and a glass (or two) of Sauvignon Blanc. Heat 3 tablespoons olive oil in large pot over medium-high heat. Add squash and sauté until beginning to soften and brown around edges, about 15 minutes. Transfer squash to medium bowl and set aside. Reduce heat to medium and add remaining tablespoon of oil, purple onion and thyme. Stir until tender but not brown, about 5 minutes. Add risotto and stir to coat for one minute. Add 1 large ladle of broth and simmer until absorbed, stirring frequently, 3 to 4 minutes. Continue adding remaining broth by ladle, allowing each addition to be absorbed before adding next, stirring often, about 15 minutes. Return butternut squash to the pot. Continue to cook until rice is just tender but still very creamy, stirring gently and often, about 10 minutes. Remove from heat. Stir in basil and 3/4 cup freshly grated Grana Padano or Parmesan cheese. Season to taste with salt and pepper. Transfer to large bowl and serve with additional Grana Padano cheese. I agree – the opening photo is fantastic. Great recipe and instructions. I almost feel like I can make risotto now, which is quite intimidating. The use of fall flavors is so nice, too. Grana Padano cheese is one of my favorite, aged sheep’s milk cheese. Yes! You can make risotto…perhaps you have? Especially with your comment about adding wine in place of the stock. This is a technique used quite often in risotto. Sometimes I do…sometimes I skip it! Thank you Shanna! Yes, I can and I have – but risotto takes a certain finesse! Which you obviously have. Lovely recipe – great job – so impressed. One of my favorite risottos. That first picture is art. I think you should go on with that style of photography, really original. this is a great recipe and photo! Even on my opposite side of the world, squash and pumpkin are in season. I use squash when pumpkin is not available since I prefer the sweetness of pumpkin. 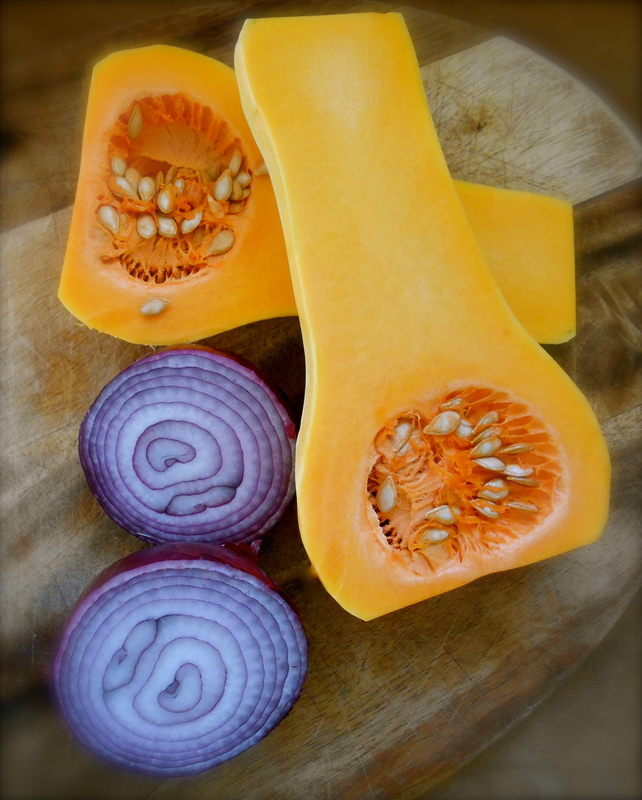 I like your photo of the squash and onion by the way! Nice! Oh good! Interesting you prefer pumpkin..I prefer squash. Particularly butternut squash. :) And thank you for the nice compliment regarding the photograph, you are the master and I am honored. Beautifully seasonal risotto, I love butternut squash, sounds delicious. I had a three mushroom risotto at the weekend. It was pretty excellent and a reminder that Autumn is upon us. I love the idea of the squash risotto. Maybe next week.. I love mushroom risotto. Years ago I frequently prepared porcini mushroom risotto. It’s wonderful! Now I’m going to have to make some soon. Love your first photo – it looks like a still life painting. 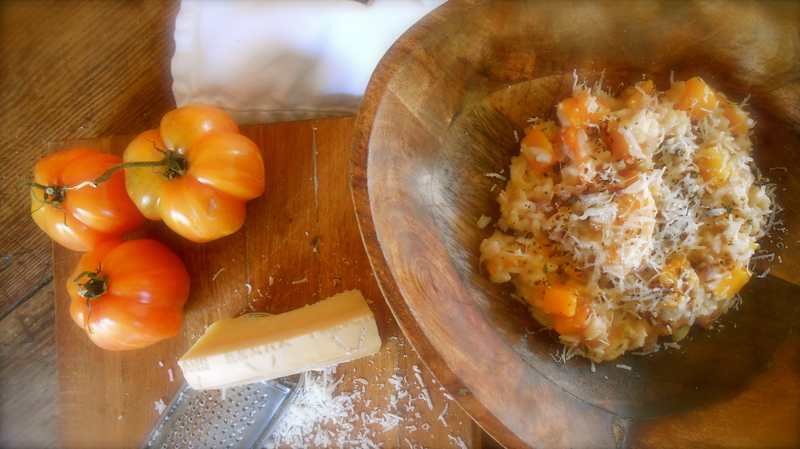 This risotto sounds fab, and just in time for Halloween with that tasty pumpkin! The combination of two different fresh herbs sounds so tasty. Pumpkins are everywhere! Good season for them this year I must say. And you noticed there are two herbs in this risotto! :) Thank you for your kind comment about the photograph. I love the way your recipes highlight just one simple seasonal vegetable. It’s my kinda food. Delicious! CGH That looks simply divine. There is something absolutely wonderful about autumn/winter squash dishes. :) I can not get enough squash by the time autumn rolls around. Love it. yes, please! Your tomatoes in the picture? Yum! Your dish looks so creamy and sounds flavorful :D I love risotto and butternut squash. Thanks for sharing! Thank you so much. I too love risotto & butternut squash together. Perfect paring in my opinion. Thanks Lisa…you are experiencing a different season right now..right? I’ve never thought of adding basil but that sounds so good. This sounds like the perfect fall dish! I know…typically sage is the choice for squash dishes. I finally used up the last of my greek basil plant with this recipe! It was wonderful. This is just gorgeous. I love the subtle squash flavor. I’ve actually never made a risotto, but it’s just the kind of warm, gut sticking dish I’ve been craving lately. When I make one, this will be it. Lovely photos as usual. I hope you got to enjoy this on a nice quiet evening. Hmmm. Maybe it is time for you to make risotto? I like your “gut sticking” description! ha! Yes, I do have a tendency to overeat when I make risotto. That is why I don’t really make it too often. Now I need to go see what you have been cooking lately. I’m a bit behind on checking in! This is one of my favorite Fall dishes. I’m a risotto fan to begin with and adding squash or pumpkin makes such a great meal. Who am I telling? Just look at that dish you created for us! Perfect! Mmm I can just taste the warmth already. Butternut squash is so unbelievably comforting, and I’ve yet to have my first of the season! This sounds delicious. I love butternut squash and also risotto! You are currently reading risotto with butternut squash and basil at COTTAGE GROVE HOUSE.